Little owlet loves drawing these days. She experiments lots with different drawing styles. Sometimes eyes are big and round, other times they are small with lashes. Sometimes there are crowns and curls and words. 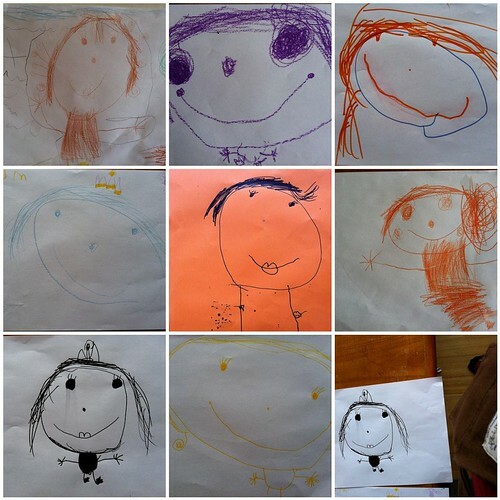 Most of her drawings are of me... I think. She could be just saying that to get extra cuddles. Either way, it works. Each one is like a little love letter. Little love letters indeed. They are all adorable and the love is so visible - from the little heart shaped mouths to the queenly crowns. My girl draws her dad, with rainbow coloured suits and really long legs, over and over. I'm not her muse! Lucky you! Oh how cute! I love the lips :) She sounds like my 6 year old - I am constantly receiving gift of little pictures.